Let’s admit it. All cars look better with alloy wheels, even the old banged-up Talbot. Not to mention something as eye-catching as the new Nissan Qashqai or BMW 3 series. And since cold days are definitely over in the UK, this is the perfect timing for equipping your vehicle with a set of cheeky wheels made of aluminium alloy. Why so, you might ask? Well, good weather means that you don’t have to worry about road debris as much as you would in the winter. Therefore, sturdy steel wheels are no longer a necessity. Good weather also means you’re able to really test your tyres’ speed limit and that’s where you want to optimise your vehicle’s weight wherever possible. Less weight means shorter braking distances and faster acceleration, less weight means better fuel efficiency, less weight means better steering response. And alloy wheels, being significantly lighter than their steel cousins, will help your vehicle lose weight. Tyres-guru.co.uk is known as your online tyre expert. 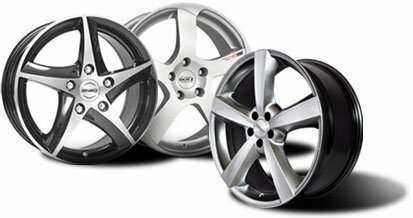 While you can certainly shop for summer tyres, all season tyres, winter tyres, and a variety of vehicle-specific tyres, we also have a huge selection of alloy rims and steel wheels in store for you. If that’s not enough and you are looking for wheel and tyre packages, we got you covered. We can even arrange to have them assembled at one of the fitting stations we cooperate UK-wide (more than 2000!) and spare you the trouble of doing it all on your own.In addition to our huge alloy rim range, we also offer you the matching screws, centring rings and caps. Keep in mind that we work with fitting stations across the UK, which you can refer to for a tyre change. With well over 100 brands as well as some of the most trusted names in the industry to choose from, you should know that you are in great hands here! Given the huge selection of rims that we have in store for you, you might feel slightly overwhelmed. Lucky for you, we can help you find the right rims for your car with ease. All that we need is detailed information about your car. Use the vehicle selection tool to start your search. Begin by selecting the manufacturer of your car. We will also require further information about your vehicle model and type. Once we have all of this information, we will go ahead and show all currently available rims for your car to you on a new page. Now it is up to you to choose. Take a look at the detailed product descriptions to make your selection with ease. Of course, free delivery is available on your mainland UK order. First alloy wheels weren’t 100% alloy-made, but were rather a combination of a steel and aluminium rims, joined together by metal spokes. First car to show off its aluminium rims was the Bugatti Type 35 in 1924. This half/half approach would be in power until 1966, when Porsche introduced all aluminium wheels on their 911S model. Fuchs is the name to remember, as they’re the wheel manufacturer behind this little revolution.